Shelley Cole, 2015 Governor General’s Gold Medalist at UFV. Students in the Master of Arts in Criminal Justice program at the University of the Fraser Valley are seasoned working professionals who bring their real-world back to the classroom to share with their fellow students. They are a motivated and accomplished group. So it’s no small achievement to receive the Governor General’s gold medal, awarded annually to the top academic student in a master’s level program at UFV. When Shelley Cole approaches the stage to receive this award at UFV’s afternoon Convocation ceremony on June 12, she will bring her considerable career experience and professional savvy, plus the knowledge and skill she has gained through two years of master’s studies. Cole, the coordinator of crime prevention services with the New Westminster Police Department, is a certified Crime Prevention through Environmental Design (CPTED) practitioner. 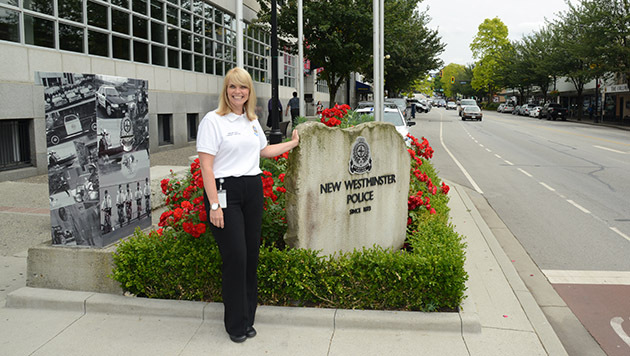 She is also a graduate of Leadership Vancouver with considerable training and education in crime prevention and reduction strategies and she has won three awards for her work in the community for these strategies. She is also the treasurer of the British Columbia Crime Prevention Association and has served as a director and executive member since 2008. She is currently an executive liaison officer for the International Crime Free Association and acts in the role of provincial coordinator for the Crime-Free Multi-Housing Program in British Columbia. “Shelley is exactly the kind of student we like to have in our master’s program,” noted Irwin Cohen, senior research chair in Criminology & Criminal Justice. The Crime-Free Multi-Housing Program is a crime-reduction program designed specifically to help residential owners, managers, employees, police and other agencies to work together. It was introduced into British Columbia in 1994 by New Westminster Police Department and has been adopted by over 20 communities in British Columbia. One of the main conclusions of Cole’s research into the effectiveness of crime-free multi-housing initiatives is that more research is needed. Amy Prevost, director of the School of Criminology and Criminal Justice at UFV, says that Cole is an excellent example of the kind of person the MA in Criminology program attracts. “She has extensive criminal justice experience, academic skills, excellent insight and understanding of the criminal justice needs of the community, and a passion for learning and sharing her knowledge and experience. We are extremely proud of Shelley, and we wish her all the best with her future endeavours,” says Prevost. Cole, a resident of Maple Ridge who commutes to her New Westminster job as well as to UFV’s Abbotsford campus, hopes to continue research in the area of crime prevention and environmental design. Warm congratulations to Shelley Cole on winning the Governor General’s Gold Medal, and all good wishes for her important work for the BC community.